This tutorial covers an important topic regarding Corona's physics engine — in specific, advanced tactics involving multi-element physics bodies. First, we should define what a multi-element body is. Essentially, a multi-element body is a physics body composed of two or more "shapes" to create a whole. It does not define a physical object that you have assembled by attaching several physical bodies with weld joints or other joints (like a ragdoll). Instead, a multi-element body is assembled from several shapes but it's treated as a unified, solid whole, wherein the individual elements don't move or flex. Must be a polygonal shape of eight sides maximum. Must not include any concave angles. 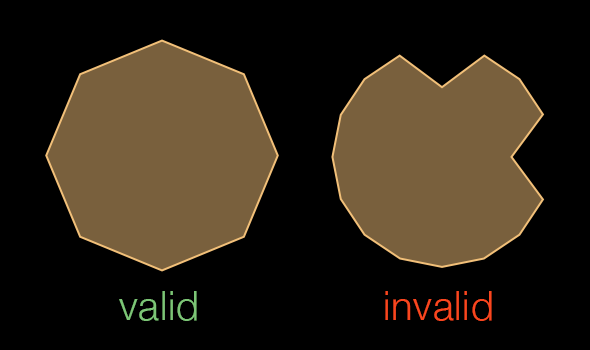 This is fine for a body that you can define as a standard, convex polygon, but what about a body that can't be traced with only convex angles or can't be represented accurately in eight sides or less? The solution is a multi-element body where the sprite/image is represented by multiple convex shapes to create a unified body. Individual elements can have unique collision filters. This is useful if you want certain parts of your multi-element body to collide/react with some but not all other physical objects in the world. Individual elements can be set as a sensors, allowing all other objects to pass through them while still returning a collision detection event (this method is utilized in the Allowing Jumps tutorial). In a collision, each element can return an integer pertaining to the order in which it was declared in the physics.addBody() function — for example, the first element declared will return 1, the second 2, etc. This allows you to pinpoint which part of a multi-element body is involved in a collision event and take the appropriate action. Once a collision filter is declared for an element or body, it cannot be changed during runtime. If an element is declared as a sensor, it cannot individually be changed to a non-sensor (or vice-versa) during runtime — only the entire body can be swapped between behavior as a sensor or a non-sensor after it has been created. Never fear, this tutorial will show you how to overcome both of the above limitations! We'll do this using the physics contact, a feature which allows you to predetermine, via the use of a pre-collision listener, what happens when the collision actually occurs. Predominantly, this is useful for voiding a collision entirely based on your app logic and we'll extend this method to multi-element bodies in this tutorial. While the enemy could potentially be constructed from several individual and distinct bodies, then assembled using weld joints, this creates another level of complexity in the enemy assembly, and it may cause some degree of physical instability which is inherent even with weld joints. As noted above, individual elements of a multi-element body can be initially set as sensors (or not), but it's "all or nothing" when using object.isSensor on the body after creating it. Thus, you can not set just one "destroyed" armor piece as a sensor while ensuring the others retain physical response, for example causing projectiles to physically bounce off. For these reasons, we turn to the physics contact in conjunction with per-element collision detection to overcome our "destructible armor" hurdle. Display the enemy object on the screen. Define the shapes for the body, starting at the head and basically working down for convenience. Add the physical body and pass each shape to the physics.addBody() call in an ordered list of elements. Note that on line 30, we also declare a simple armorStates table to keep track of the "state" of each individual armor object. This will be used to determine if a particular element is on or off — or to put it another way, to determine whether an armor element is "intact" or "destroyed" in game collision logic. For this we can use a simple non-indexed table of 7 boolean values (7 armor pieces), all initially set to true. If you set the physics draw mode to "hybrid" (line 4) and run this code, the skeleton will look something like the image here. 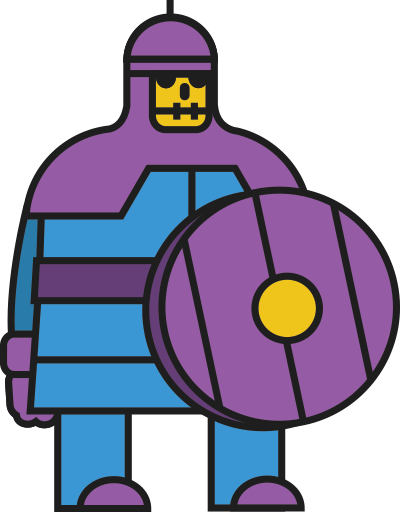 Note that some of the armor pieces overlap other pieces — that is perfectly acceptable in this scenario because the player will still need to destroy individual pieces one-by-one. The order of declaration of body elements (lines 21-27) should be noted for later, as it will pertain to the integer of the specific element returned during collision detection. 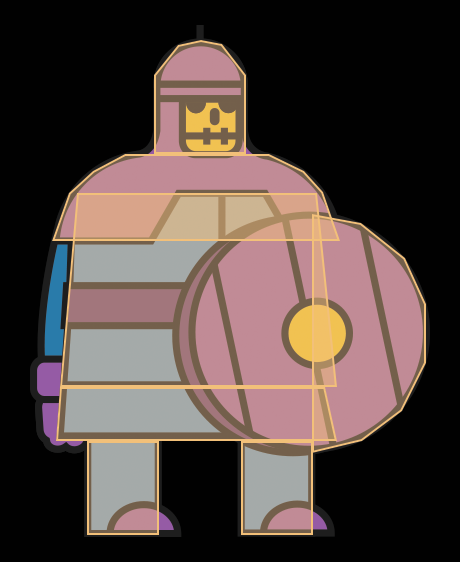 Knowing this integer and which body element it relates to is crucial when expanding upon this basic scenario — for instance, if you know that the helmet was struck, you may want to change the skeleton image/sprite to a frame where it visually has no helmet, or you might want to deal extra damage based on a "head hit" versus a "leg hit." Next, we'll declare the basic pre-collision listener. This type of listener must be used if we intend to utilize the physics contact, because we'll be telling Corona to manage the collision state immediately before it occurs, not when it occurs. This function accomplishes just the basics. Anything that collides with the skeleton will return the corresponding integer of the specific body element as event.selfElement, according to the order in which they were declared. So, because we declared the helmet as the first element, a collision involving it will return 1. A collision with the mantle will return 2, a collision with the chest will return 3, and so forth. -- Set the associated armor element state to "destroyed"
Basically, if the armor element is "destroyed" in our game logic (line 35), we can use the physics contact (event.contact) to instruct Corona to void the collision entirely, making it appear as if that element doesn't even exist (our ultimate purpose). In contrast, if the armor element is still intact, we allow the collision to occur naturally but we toggle its state to "destroyed" by setting its index within the armorStates table to false — this will ensure that the armor element does not cause a physical response upon the next collision event. That's basically it! With this code, each individual armor piece can be toggled from an active state to an inactive state, letting you control your game logic at a fine-tuned level while still utilizing a single unified physics body. If you really want to get creative, consider expanding this concept to armor health levels. In the scenario above, just one hit to any particular armor piece will "destroy" it, but that's not very realistic — after all, shouldn't armor be able to absorb some amount of damage before it's destroyed? Essentially, on line 35, instead of checking for a value of false, we check for a value of 0 — this indicates that the "health" of the armor piece has been reduced to nothing and it can be considered destroyed. Additionally, on line 40, we subtract 1 from the piece's health instead of setting it to false as in the original version. Yet another creative option is to detect collision forces upon the skeleton's armor, dealing more damage based on how hard/fast a projectile strikes a piece of armor. This method is outlined in more detail in the Uniqueness of Post-Collisions tutorial. As you've learned in this tutorial, mutli-element physics bodies possess some valuable traits that joint-assembled bodies don't, but they also present some hurdles. Hopefully these tips have shown you how to overcome those in your physics-based apps! Character art in this tutorial is courtesy of Ponywolf, creator of amazing open-source game templates like Match 3 Space RPG, Sticker Knight Platformer, and Endless Sk8boarder.